I will keep this relatively short, as we've had a busy day. 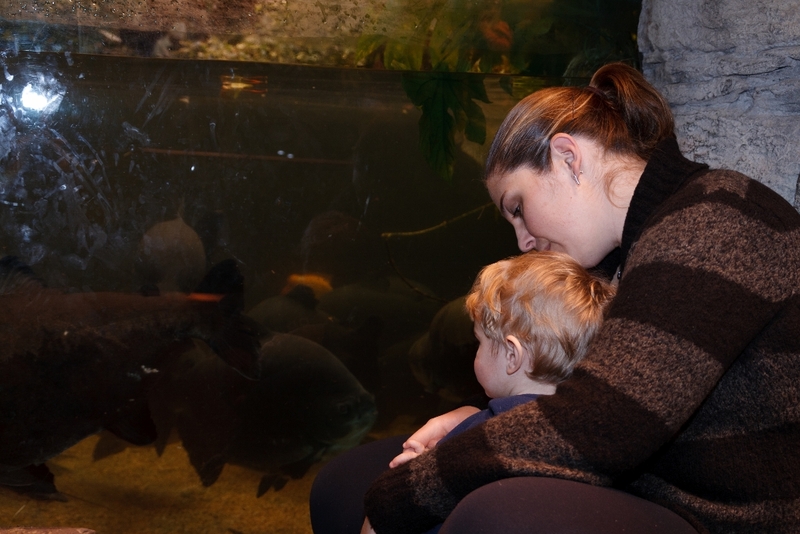 Zumba in the morning and then off to the Biodome for the afternoon. We bought ourselves an annual pass so that whenever we're going nuts inside with Logan this winter, we can head out there to keep him somewhat stimulated. This recipe was inspired by both my sister and Heather, who coincidentally, both started talking to me about green monster smoothies at the same time. 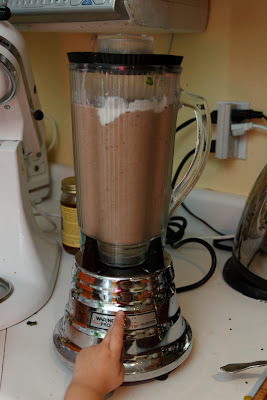 My sister had also mentioned that there are apparently lots of good recipes for green monster smoothies on Oh She Glows, though I have yet to check them out. You can check them out here at the Green Monster Movement. This also coincided with another friend asking for more recipes with hidden vegetables in them for her kids. 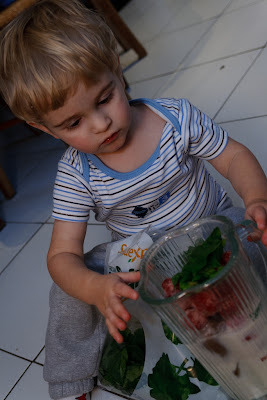 So it got me thinking that maybe it was high time for me to try hiding veggies in smoothies, given that both Logan and I love them. Particularly since it's hard to get vegetables in him as a side dish for the time being. I'm not quite ready yet to do a truly green smoothie like Heather does, with hardly any fruit. Not sure that I ever will be, to be honest. But I'll try to sneak more veggies into them over time. 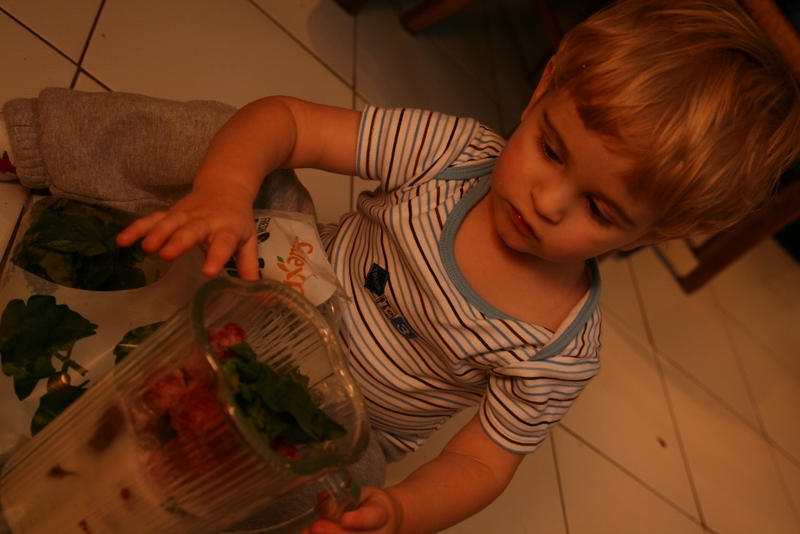 Though he enjoyed trying to take the strawberries out! I don't have a specific recipe for my smoothies, but will try to indicate general quantities. I used a good 4-6 very heaping large spoonfuls (soup spoons) of plain yogurt and then poured in some milk. Just enough for there to be some liquid for the smoothie to mix. 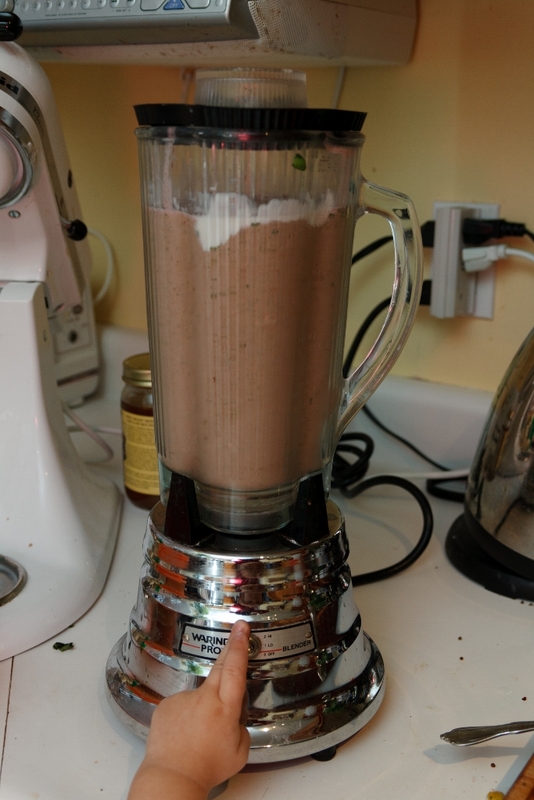 I then added a frozen banana and a half and two good handfuls of frozen strawberries. 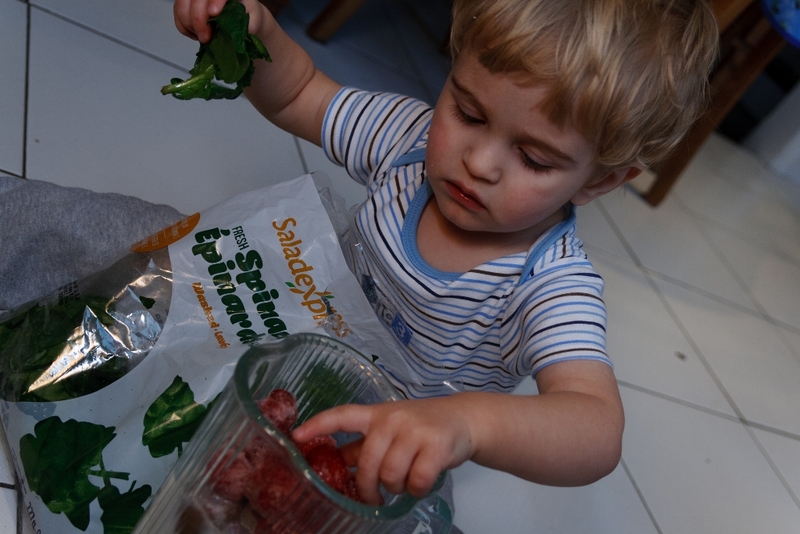 And then filled the rest of the blender with spinach. Oh, and threw in about a teaspoon of honey, just to give it some sweetness. And this made enough for three of us for a good snack. 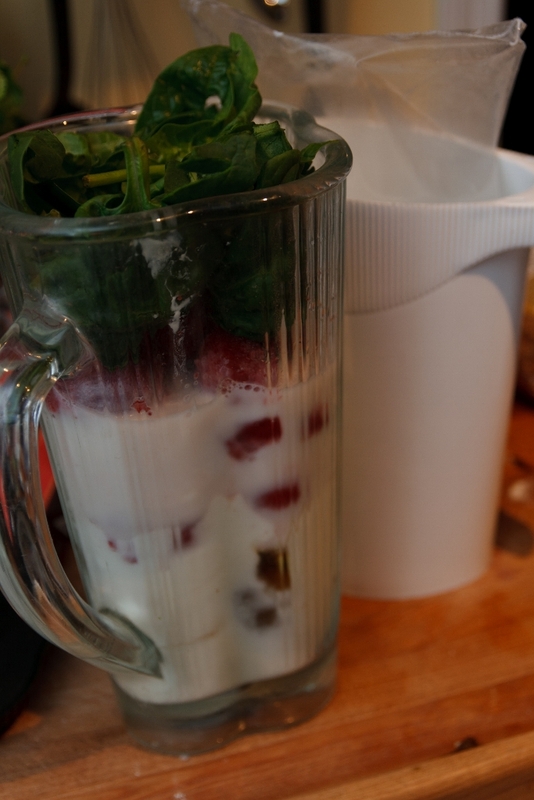 It's important that your fruit be frozen, as that's what gives it a smoothie texture. If you don't have any frozen fruit, you can throw in a good handful of ice cubes instead. Ever since my smoothie addiction started many years ago, I haven't thrown out any fruit. Anything that is going bad gets chopped up and put into little ziploc packages in the freezer for future smoothies. I've tried everything right down to grapes and so far haven't found any fruit that doesn't taste good in a smoothie. My preference is to always include some banana or pear though, as I like the nice creamy texture these give to smoothies. I went through a phase a few years back where I was busting blenders every 6 months or so. Until I found this wonderful WaringPro blender at Costco. Just be careful to stay in the room to be sure the blade isn't getting stuck. And if it is, just pour in a bit more milk or stir it a bit, if necessary. I should mention that you couldn't taste the spinach in this at all! This smoothie probably wasn't green enough to really be called a green monster smoothie. But I'm going to keep adding in more and more greens until you can taste them. De-li-cious. 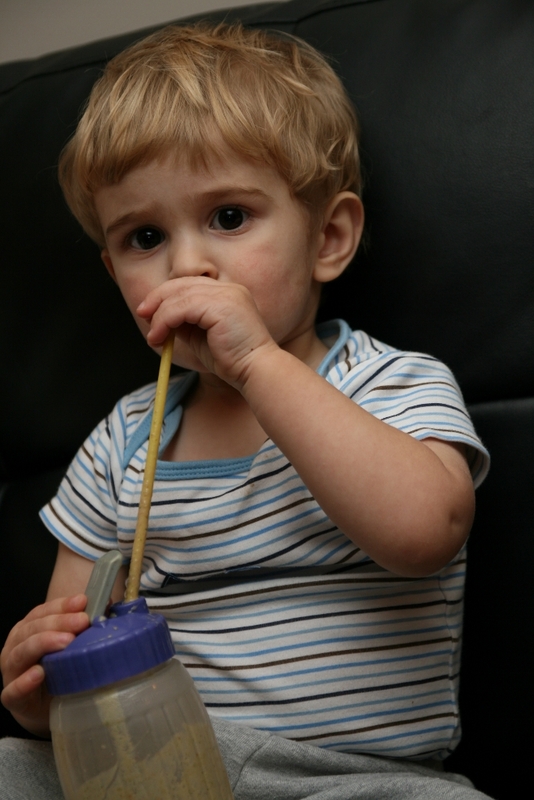 Even Jerome drank one and liked it. Just a little note too that you can clean your blender by putting a bit of dish soap in it, filling it about 2/3 full with water, putting on the lid and turning on the motor for a couple of seconds. 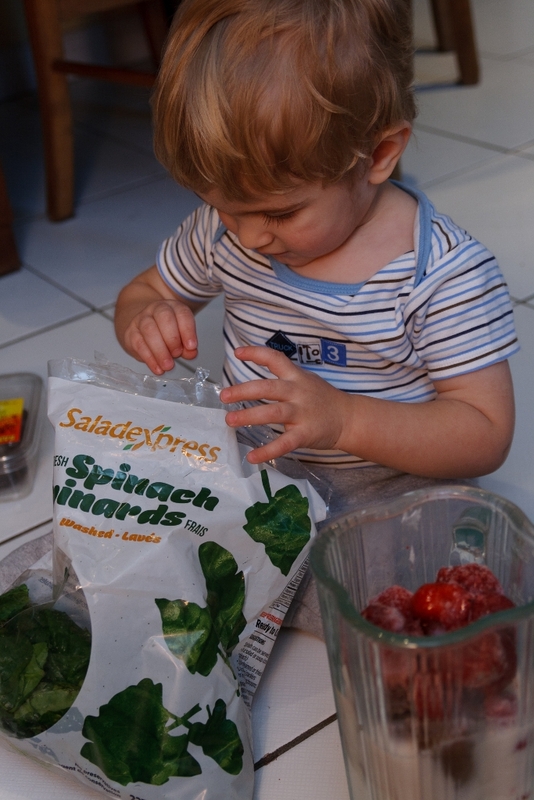 Which makes smoothie making practical even when you have two little ones running around. And on that note, I'm off to make some homemade chicken fingers with broccoli hidden in them. They'll be up here shortly if they turn out to be blog-worthy.